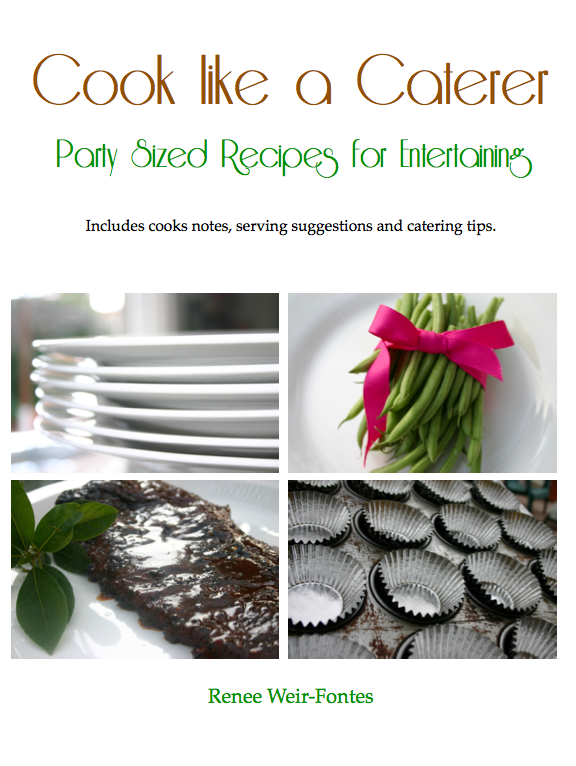 I plan to go beyond the Cook Like a Caterer cookbook by adding an blog entry for each and all of the recipes with great pictures and expanded content. 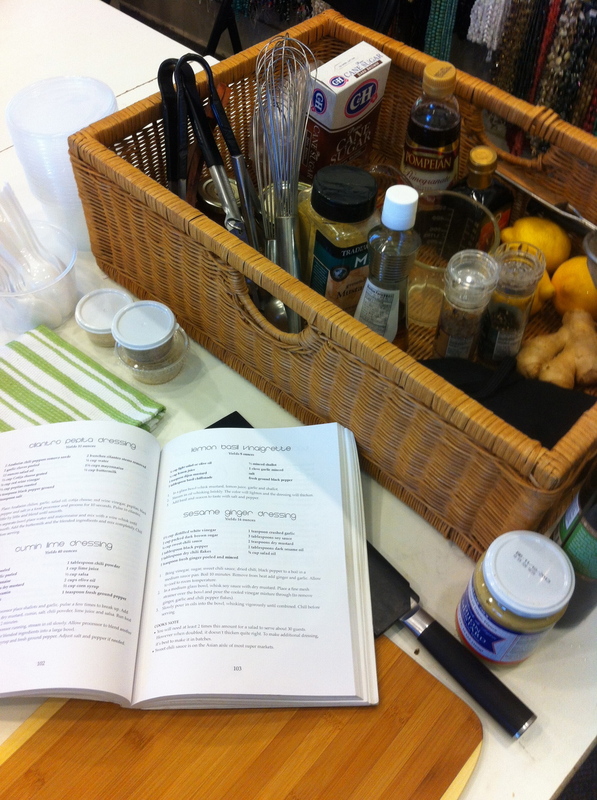 Why blog now after the cookbook is published? As I'm typing this I feel kinda strange about sharing something as basic as a "how to" vegetable tray. But that "why" feeling fades when I remember back to the day when I was new to catering and clueless on how much to purchase and prepare. Just a side note: This is the third post on basics and I was surprised to see how often "How to Make a Fruit Tray" and "How to Make a Party Cheese Tray post" were searched. Most parties I attend still put out some sort of vegetable appetizer, especially when there are a wide variety of diets to consider. Both a vegetable tray and a veggie stick platter appear in "Cook like a Caterer, because of their simple yet important staple of party fare. Below is a guide for approximate amounts to prepare for about 25 guests. The fresh spinach dip is cool and delicious, feel free to serve your favorite dip along with the tray. Raw vegetable crudite is a welcome snack at any party and the fresh spinach dip is classic. Hollowed out produce, vases or flower pots are great containers for the spinach dip. Lined baskets and even a cupcake pan can make interesting display platters for the vegetables. Put green onions, garlic and spinach in a food processor and pulse 2 to 3 times. Add mayonnaise, sour cream, lemon zest, lemon juice, hot sauce, onion powder, salt and season with pepper. Puree until smooth. Transfer to a bowl, cover, and refrigerate for at least 1 hour (or up to 3 days). Stir the dip and serve with vegetables. Substitute any suggested vegetable for something that you prefer or double up on favorites, placing in separate sections on the tray. Choose crisp, firm, high quality vegetables. Fresh vegetables will have a mild scent, no brown spots or soft/slick areas. Wash all vegetables thouroughly and store in separte containers (if prepping ahead) to preserve flavor. Colorful vegetables are beautiful and appetizing. Choose more then one variety of a vegetable, like purple broccoli or yellow/green cauliflower to brighten the tray. Use seasonal vegetables like asparagus or green beans, which can be slightly blanched to be brighter and tender. Other raw vegetables like radishes, whole pea pods and jicama offer interesting color and flavor. Store pre-cut vegetables have a short shelf life so cleaning and cutting the vegetables yourself will give you a better quality. Choose some colorful kale or large edible leaves to line the platter or garnish with herbs. Prepare at least 2 ounces of prepared vegetables per guest. For small gatherings put out a little more. Make cuts in broccoli and cauliflower, so guests have a "handle." To make a try seem fuller, build a bed of curly kale before you set the vegetables on it. Placing the dip in the center of the tray will help it take shape and create a focal point. For a small event, arrange smaller glass bowls on a roomy platter, stand up vegetable sticks in the glasses. Other great garnishes are olives, canned or pickled vegetables (like baby corn). Serve 2 to 3 ounces of dip per person. A cheese assortment ready for service at a wedding reception, makes a beautiful make ahead appetizer. Photo by Dinner At Eight Productions. There is nothing more eye-catching and appealing then a well selected assortment of cheeses that are artfully arranged for a party. The cheese tray offers popular party sustenance with make ahead convenience. Today's deli section in the market allows you to choose from a wide variety of soft, creamy, dry, sharp and mellow varieties to keep it interesting and uniquely you. Not sure what cheeses or how much to put on a platter? Below is a basic guide to popular cheeses and offers something for every taste. Pair with mild crackers, bread and fruit and you will have an opening act that will please every party guest! For an appetizer cheese tray figure about two ounces of each cheese per guest. Below is an example of a typical assortment. When it comes to presentation, you can give even the most simple cheese assortment a dash of rustic charm or glitz and glamour with wooden cutting boards, marble tiles and other clever serving pieces. Other good choices to add are Chevre, Manchego, Parmigiano-Reggiano, and Fetta. Substitute any suggested cheese for something that you prefer or if your guests have milder pallets, leave off blue or sharp cheeses. Serve at least one high quality but familiar cheese. Colorful cheeses are beautiful and appetizing. Choose cheeses with interesting rinds and leave whole for display. Try herbs, wine or smoked versions of your favorites. Choose a variety of flavors from mild and creamy, to tangy, sharp and a little spicy. For texture choose at least one soft, one medium and one hard cheese. Cut gourmet cheeses have a short shelf life so check carefully for mold and spoilage before you buy. Theme your assortment choices by choosing all cheeses from one region, like an Italian or French collection. Choose at least 3 different cheese selections for smaller gathering of 4 to 8. For every 2 additional guests, add an additional selection. Most guests will only eat 2 ounces per person before a meal, but that might look like a small amount on the tray, you might plan to put out a little more. Larger groups of 20 or more, plan on serving a selection of 8 different cheeses about 2 ounces per person when other appetizers are served, 3 to 4 ounces if cheese is the only appetizer. Cheese only parties, plan 6 ounces per person. Set the cheese out a half hour before eating to bring them up to room temperature. When using wedges of cheese, put out a separate knife for each cheese. Label cheeses for guests who may not be familiar with them. For a small event, arrange cheese on a roomy platter, marble or cutting board, put cheese cutting tools near for guests to cut. Garnish platters with dry fruits like grapes and whole berries. Dried-fruit like apricots and cranberries are perfect with cheese. Other great garnishes and condiments are whole nuts, honey, fresh ground black pepper, thick balsamic vinegar and olives. Serve 3 types of crackers and or thin sliced baguettes along with the cheese. For large events slice some of the harder cheeses into thin flat squares so its easy for a guest to slide right onto a cracker. A recipe for a fruit tray might seem unnecessary but for any caterer it is the most requested item on the menu. It is helpful to have a quantity guide to assist in purchasing the right amount of fruit and avoid over-buying such a perishable item. 1. Keep the same fruit together on the platter. Mixing it up makes less of an impact and effects the fruits flavor. 2. Choose what’s ripe and tasty. It is better to serve fewer choices then unripe fruit that makes you pucker. 3. Smaller items like berries and softer items like kiwi last better and are more attractive toward the center or top of the platter. 4. If using pineapple the leafy top makes a nice centerpiece for your fruit platter (and it’s free). Place it on the platter first at the center or top then arrange other fruits in sections around. 5. Snip grapes in small 4 to 5 grape clusters then bunch back together to hide stems. Guests can grab a cluster and they have a visual impact as a group. The calculations below are for a basic fruit tray. Customize your platter with fruits in season and garnish with a pineapple top for added height. Wash and dry fruit. 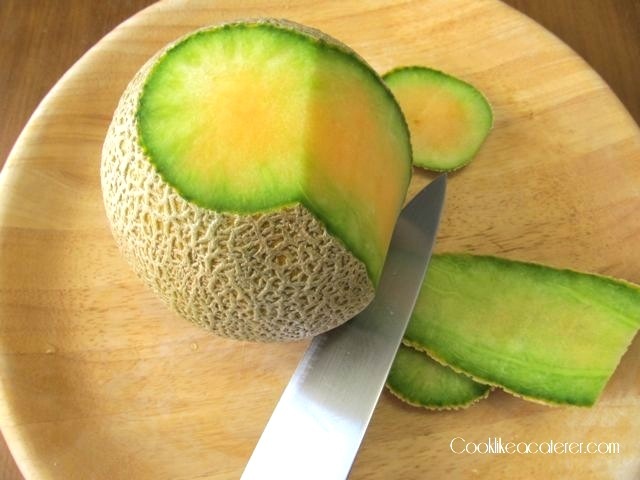 Cut away rind and clear seeds from honeydew and cantaloupe. Cut rind away from watermelon cut in half lengthwise then cut in half and half again, slice and arrange on platter. Quarter honeydew, cantaloupe, slice arrange with watermelon. 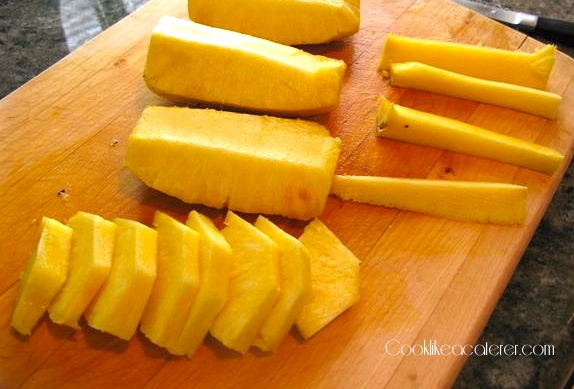 Cut pineapple top and use as a garnish for the platter. Cut away pineapple rind, and quarter lengthwise. Cut away core, slice and add to platter. Snip grapes into small bunches, add with strawberries, arranged over other fruits. When fruit is not in peak season you can use flavored syrups to lightly drizzle on top of your fresh fruit. Flavored syrups will add another dimension of flavor to your fruit tray. Use other berries, tropical fruits and kiwi to garnish as well.